Buy The Smurfs 2 for X360 in India at the best price. Screenshots, videos, reviews available. Shipping: This item ships FREE! The Entertainment Software Rating Board (ESRB) ratings are designed to provide consumers with concise, impartial guidance about the age-appropriateness and content of computer and video games. The product that you are viewing is suitable for ages 6 and older. May contain minimal cartoon, fantasy or mild violence, infrequent use of mild language. 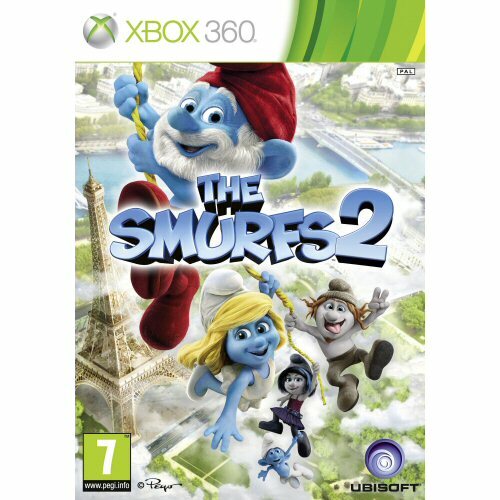 The Smurfs 2 is an Action-Adventure Platformer game that follows the story of the second movie of the Smurfs that take place in New York and Paris. You will master your favourite blue heroes to succeed on their quest to rescue Smurffette from the evil Gargamel. Play Co-operatively with up to (local multiplayer) with 9 different playable Smurfs with one special abililty per character. Experience the Smurfs adventure just as it is in the move while playing through 6 different worlds: Smurf Village, NYC, Paris. Collect over 20 different Smurfs while playing in the various levels and take them to your Smurf Village. Play against 12 different enemies and battle 6 exciting bosses including Gargamel, Azrael and the Naughties.